If you are regularly following me either on blog or on Instagram, early this year, I made a trip to Vietnam. Before heading off for Lunar New Year in Hanoi, we had our transit in Beijing, China. While booking the trip, we took the opportunity for a long haul transit which will allow us to go out from the airport and explore the city a bit. Not only the tickets are usually cheaper when you have big gaps between changes, but also we spend in Beijing about 12 hours, so long enough to see the city and get in and out from the airport. 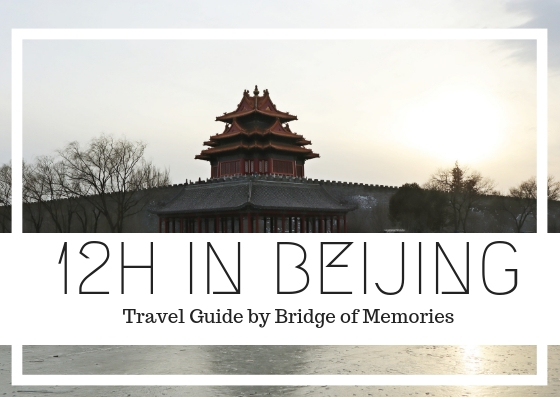 Now, I will share with you some insights and tips to what to do in your layover time in Beijing as well as the whole process to get out to the city. First of all, check whether you need visa at the destination where you planning to have a layover. Some countries, like China, offers 24h or 72h transit visa on the day (applicable to some countries only). Always do your research prior, and check whether your passport is valid for it, and whether you have to apply online or on the day. Check what documents and policies are for these applications. Secondly, airports can reject your transit visa due to not sufficient hours in between, so always make sure that your time frame is doable. Take in consideration that it will take you more then an hour to get out from the airport to the city (if lucky that there won't be visa queues) and then you have to be back at the airport 1-2 h before your next departure. Check how far is the airport from the city and check how you will get our and back. Thirdly, budget yourself. Ask yourself questions like how much it will cost you to spend a day in that city. Is there enough things to do for your time frame? How easy is it to get around there? Or will you have hand luggage with your or where will you leave them? Again, it comes to some research prior booking tickets. Research the city and how easy is it to get around to see sights. In addition, check what time you arriving and departing. If you are arriving in the evening or late night times, I don't think there is much to do out in a city, right? (unless you would like to layover to go have a drink or clubbing). 12 h in Beijing, what to do? We were lucky that there wasn't any queue for transit visa (maybe just 3 people in front of us), so the whole process was quick. I have just fill in a form, and have my passport and next ticket with me ready to show them. After the verification, all was done and I was ready to leave the airport to go out. Since, I have been in Beijing many and many years ago, it was nice to re-visit. Prior coming to here, I have checked some places where I wanted to go, but because we get to Beijing in the afternoon, we did not have much time to go do touristy stuff, as many places were closed by 5 or 6 pm. Hence, me and my boyfriend just head to the main Tianamen square and Forbidden city where we were until the closing time. Unfortunately, main tourist attractions or even the Great China Wall is scattered around from each other, so always plan where you would like to visit prior, to avoid unnecessary transport and time costs. Pick an area or couple points to fully explore rather than trying to fit everything in one day. Moreover, there are many travel agencies offering layover tour packages, where they would pick you up as well. Therefore, if you don't want to risk your time and take the hassle by exploring yourself in such short time frame, check for available layover tours. From the airport, we took the Airport Line and then change to metro to get to Tiananmen square station. We took a walk around this big square, passing National Museum of China, gates and other museums to the monumental entrance of the Forbidden city, where we got our tickets for 40 Yuan (during off-peak time). Make sure to withdraw money at the airport before you will go out! The Forbidden City is a palace complex in the central of Beijing. It is a massive place with former Chinese imperial palace, temples, Palace museum and gardens. Allow yourself at least 2h to be here to see everything. When exiting through the north gate from the Forbidden city, you will be surrounded by Jingshan park in front and Beihai Park on the west. Take a stroll around the park to see the beautiful temples and monuments. I would recommend to go to Beihai park, as it is a 1000 year old imperial park with beautiful lake and surrounding. If you have time to explore more, not far from this location, you can go visit Lama temple. A Buddhist temple and monastery located in Dongcheng district. The building combines Han Chinese and Tibetan style. However, we were running out of time and many places were closed by evening. Hence, we have decided to walk down to Wangfujing street. The famous shopping and commercial street. Here we have passed St Joseph's Wangfujing church and the night market where you can try some quirky bites of insects. You will also find many shopping malls and shops around, so it is a good opportunity to maybe buy some gifts or souvenirs. However, our main goal was to find a place to eat some Chinese cuisine. Don't miss out some Beijing duck or dim sum dishes while in there! We went to Grandma's restaurant in one of the malls on Wangfujing street. After our dinner, we slowly get back to catch a last train to the airport (around 10pm). And that was pretty much it for the day! And our total costs of spending during this layover mini trip? £44 (cost for for two people)!